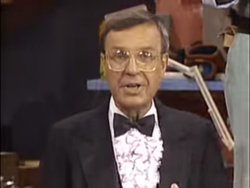 First appearance "Game Show Host"
James John Lange (August 15, 1932 - February 25, 2014), more commonly referred to as Jim Lange, was a famous game show host who appeared in The Super Mario Bros. Super Show! live-action segment "Game Show Host". After Luigi is knocked out and starts to believe that he is a game show host, Jim is called by Mario to see if he can snap Luigi out of it. Jim reminisces about a contestant of his once he sees Luigi before being reminded by Mario to try and help him. He tries to get Luigi's attention, but everything he says is recognized by Luigi as "answers", frequently wrong ones. Mario starts to panic about Luigi's state, which leads to Jim trying to calm him down and reflecting on another contestant. Jim then gets an idea once Mario mentions the furnace; he presents the fact that the furnace has burned out in the form of an answer. Luigi agrees and lights the furnace, causing him to be knocked out again. He wakes up, perfectly normal, after being slapped by Jim and Mario. Jim is overjoyed and asks Mario and Luigi to perform a special way of saying goodbye he has done on one of his shows. However, while performing his goodbye, Jim accidentally knocks Luigi out, making him believe he is a game show host once again, to the frustration of both Jim and Mario. This page was last edited on September 13, 2018, at 11:16.